The biggest video game companies in the world were caught off guard by the smashing success of this last-player-standing mode. Over the last decade, video game companies have churned out hit after hit across consoles, PCs, and mobile devices and it seemed giants like Activision Blizzard (NASDAQ:ATVI), Electronic Arts (NASDAQ:EA), and Take-Two Interactive (NASDAQ:TTWO) were gobbling up most of the market share. As long as they kept the hits coming, it seemed like there wasn't any real competition to worry about in video games. That was, until Fortnite Battle Royale. Fortnite was released in July 2017 by Epic Games, a privately held game developer 40% owned by Tencent, as a game where up to four players work together to complete missions and rebuild the world after a natural disaster. But it was a floundering game until Fortnite Battle Royale was released in September 2017 and that's the product that has taken the video game industry by storm. Fortnite Battle Royale has attracted young gamers, hooked regular gamers, and its battle royale mode -- which blends elements of survival games with the last-player-standing goal of other games -- could be a template companies copy for the next decade. Activision Blizzard's Call of Duty Online in China added the game mode and Overwatch is looking to add battle royale as well, while Electronic Arts is also developing the mode for Battlefield V. If you're an investor in video game stocks, it's time to start paying attention to the tidal wave that's hitting video games and depending on how you look at it, Fortnite Battle Royale could be good or bad for the rest of the industry. First things first: What is Fortnite? Fortnite is a multiplatform game whose battle royale mode pits players against one another with the goal of being the last one standing. Winners get prizes for conquering campaigns or seasons. Developer Epic Games has built the game on a free format, but allows players to buy upgrades through V-bucks, which can be used to buy into games or upgrade your player. It's been a very successful business model. According to research firm Superdata, Epic Games generated $296 million in revenue from Fortnite in April, more than doubling from $126 million in February. 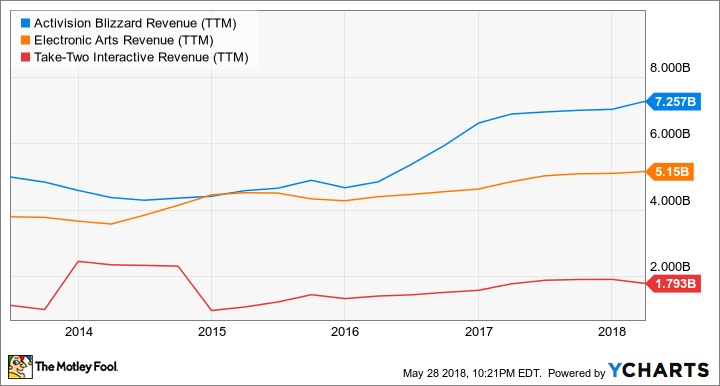 On an annualized basis, April's revenue pace would be $3.55 billion each year, which would make it nearly as big as Electronic Arts. ATVI revenue (TTM). Data by YCharts. The impact on the video game industry isn't lost on the competition, either. Gaming is constantly evolving and innovating, which often expands the marketplace, and the success of Fortnite is no exception. This game is attracting new players of all ages and genders, and it is helping gaming become even more mainstream entertainment. Our biggest franchises are anchored by communities of tens of millions of players, and while many of our players try new games, they always come back to the franchises that are the foundation of the communities that they are a part of. The positive twist that players always come back to Activision Blizzard games is easy to sell today, but we've never seen a hit like Fortnite Battle Royale and I don't think investors should assume that past trends will hold given the game's success. According to data compiled by Statista, in April 2018 Fortnite was the most watched game on Twitch (a proxy for engagement) with 127.9 million hours viewed, nearly doubling League of Legends' 73.7 million hours. According to EA COO and CFO Blake Jorgensen, Fortnite Battle Royale is a way to bring in a younger audience. He said in the company's recent conferecne call, "... we do think, in the case of Fortnite, it's helped grow the whole marketplace. And in particular, it's bringing younger people into the marketplace and younger people into first-person shooters, and I think that's good for the long-run health of that category for all of us in the industry ... "
I think the fact that Fortnite surprised everyone, particularly given where Fortnite came from, after all what is now in the market was based on a prior release that did not perform all that well. It's just a reflection of the fact that if you innovate and give consumers what they want, you can get an extraordinary result. And while we would love to corner the market in hits, and we certainly see it as our job to do so, we don't have all of the hits and we shouldn't expect to. As much as each company may want to play off Fortnite Battle Royale as a positive for the industry, the fact that they aren't the ones developing the industry's biggest hit is both a new phenomenon and a bit jarring to the biggest video game makers in the U.S.
Activision Blizzard says the vitality of Fortnite Battle Royale shows how the right content can capture the attention of millions of video game players in a very short amount of time. That's a fair assessment, but this time around, it's Epic Games that has the smash hit of the year, not Activision Blizzard, EA, or Take-Two. That's not a position these companies are used to. What we don't yet know is the financial impact Fortnite will have on any of these video game companies' quarterly results, but it'll likely be noticeable in coming quarters. If engagement is up for one game, it's naturally going to be down for others, and at the end of the day, engagement is the key to making money in video games.